MANILA, Philippines - Avid fans of the hit loveteam of Maine 'Yaya Dub' Mendoza and Alden Richards popularly known as AlDub were delighted as the tandem got the sweetest 'holding hands,' duet and took another selfie during the 'Kalyeserye' episode on Saturday, October 3, 2015. The third date of the AlDub loveteam was set in the Broadway Studio for Yaya Dub and Lola Nidora (played by Wally Bayola) to meet the Eat Bulaga icons TVJ (Tito Sotto, Vic Sotto and Joey de Leon). TVJ serenaded Lola Nidora, as she is also being teased to Jimmy Santos. "Kahit gaano kayo ka-busy, spend time with your family," Lola Nidora's words of wisdom today. Another twist on the story was revealed on Saturday. The Kalyeserye ends with Alden leaving together with Lola Nidora while Maine was left in the studio. 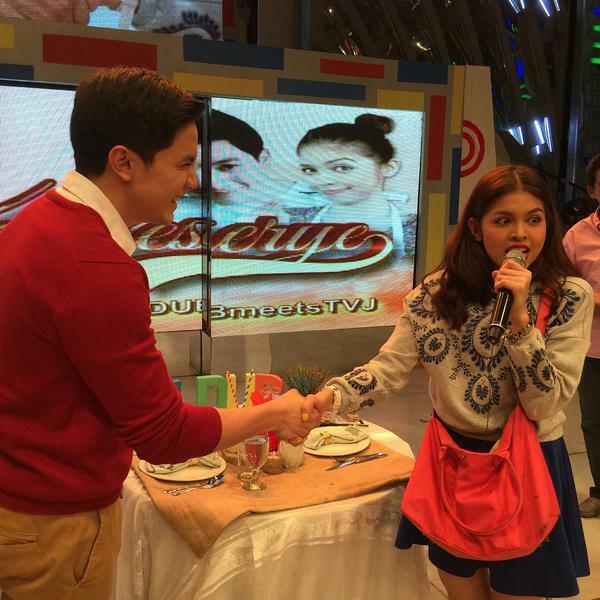 The exchange of Alden and Maine was requested by Lola Nidora.